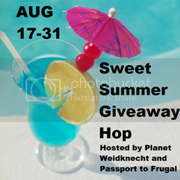 From August 17-31, you can visit all the participating blogs listed below and enter to win their wonderful prizes to top off your summer in a sweet way. Each blog is offering a giveaway prize of at least $25.00 and you might be lucky enough to win them all! raw, creamed honey in 4 oz jars. to Sweeten up your Summer! We have been striving to eat healthier around our home. I have always loved the health benefits of honey and the help in dealing with seasonal allergens. I have been know to skip white sugar for long periods of time, and just use local honey for things like sweetening my tea and coffee, oatmeal, and even for baking cookies. Honey is so much sweeter than processed sugar, and healthier by far. 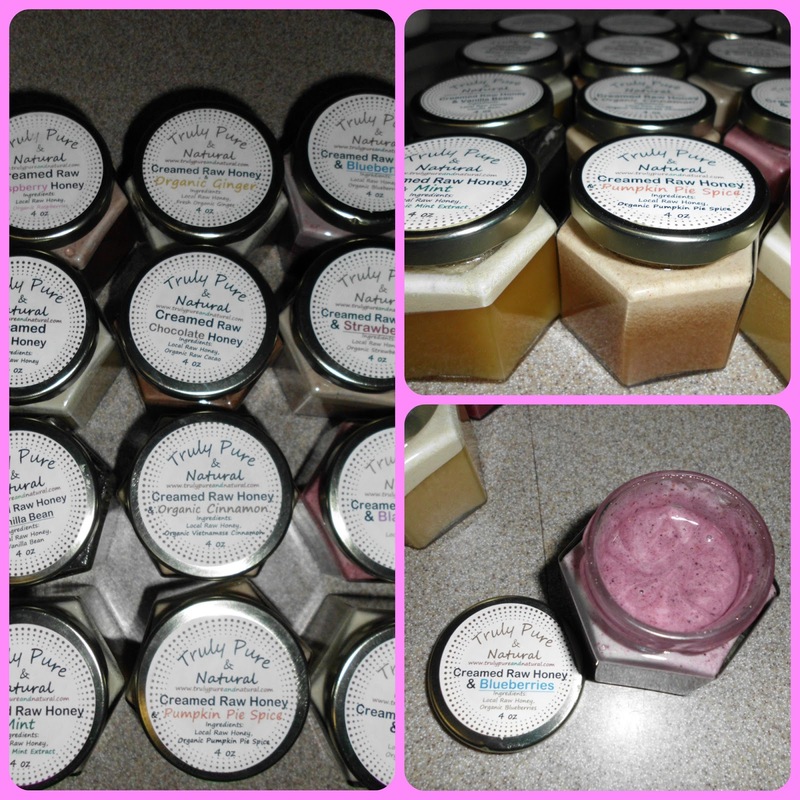 Truly Pure & Natural sent us an awesome sampling of their creamed honey! This honey is not cooked, which means the healthy enzymes remain intact. I asked Founder Denise how they creamed the honey. "Two years ago, my husband, Nick, developed this proprietary method to break down the crystals without the use of heat. Traditional creamed honey is made using the Bryce Method, which includes heating the honey to 190 degrees, which kills essential enzymes and nutrients in the honey. Because he wanted to preserve those nutrients, he developed a method to make the honey creamy without the use of heat. Creaming the honey is a labor intensive process, and after the honey is creamed, he makes each batch by hand, using only the finest organic fruits and spices to naturally flavor the honey. The result is a premium product with a myriad of uses!" Because of this there is some separation in the honey. You simply have to mix it to get the full creamed effect. No need for refrigeration! I much rather put some warm honey on my toast, oatmeal or pancakes than a cold refrigerated one. We set out to try each of these wonderful honey products. Best way for us.. Pancakes! My daughter offered to make the pancakes and of course her brothers offered to sample the honey. Some of the favorites for pancakes was Organic Blueberry and Organic Strawberry! While we ate I tried some Organic Cinnamon in my coffee, heavenly!! Wonderful flavor. I asked Denise for some brainstorming ideas to use these gems of yummy goodness. and many more ideas! These are a healthy, natural alternative to the nasty sugar we are inundated with in our foods. Even tastes great right out of the jar! Sounds best to me and I would put it in my tea. I think the Creamed Raw Honey - Organic Strawberry sounds delicious! Thank you! I would like to have Cinnamon on toast. I would like to try the chocolate honey on waffles or toast. I want to try the Creamed Raw Honey - Organic Raspberry 4 oz because I love Raspberry jam on my toast and I am sure that this would be delicious honey on my toast! I would like the blueberry on my morning oatmeal. the organic ginger sounds amazing and would probably be a great addition to broiled peaches or oatmeal! I'd like to try the organic strawberry and I'd make a dressing with it. They all sound great but vanilla sounds lovely! It would go on everything! I would like to try the plain creamed honey on toast. They all sound so good, but the first I would open and try would be the vanilla honey and put it on some toast of course. Organic cinnamon sounds the best to me. The first thing I would try it on would have to be toast. creamed raw honey plain and I would eat it on toast. I want to try the vanilla. I would put it on my waffles. I would love to try the Organic Blueberry flavor! I can't wait to try it in my morning oatmeal! The pumpkin pie spice one sounds nice. We have been having fall weather lately which has me thinking about fall foods like pumpkin. I would like to try the honey on pancakes, either regular ones or pumpkin ones. Chocolate Honey! On toast, of course. Would like to try several but the Organic Cinnamon would be good on biscuits. I really think the strawberry sounds good, I just won some organic graham crackers the other day. I think this would taste great paired with those for an occasional sweet snack. The Organic raspberry sounds good my boy and I love honey on our steelcut oats! Creamed Raw Honey - Organic Strawberry sounds yummy! I've had orange honey and it was great! I'd like to try the creamed raw honey - organic raspberry on some toast with peanut butter. It would have to be the raspberry. Can I come to your house to eat? I'd like to try the Vanilla in my coffee! The raspberry flavor sounds great! I would have it on biscuits. The Organic Blueberry sounds yummy! I'd love to try it on my morning bagel. I would get regular and raspberry. I would first try it in hot tea! I would get Creamed Raw Honey - Organic Ginger for hot green tea. Would love to see them add cherry to the line. organic raspberry sounds the best! I would first try this on toast in the morning! it sounds delicious! They all sound good but I think my favorite would be the plain. I would try it on hot biscuits...yum! I love the taste of honey so I think I would like plain the most but chocolate sounds awesome too. I'd love to taste the lemon-ginger raw honey and try it in a cup of hot tea. I think it would go great with chamomile. I would love the cinnamon one. I would love to try the the chocolate raw honey with strawberries sounds good. Blueberry sounds amazing! I would try it on my waffles! The Creamed Raw Honey - Organic Chocolate and I would try it on toast! I would love to try the Creamed Raw Honey - Organic Chocolate on toast. Creamed Raw Honey - Organic Strawberry on a toasted bagel. I would like to try the Creamed Strawberry Honey on toast. Creamed Raw Honey - Organic Chocolate . plain sounds the best for me! I would put it on a pb, banana and honey sandwich! I would love to try the raspberry & I'd eat it on homemade bread first! YUM! I'd like to try the cinnamon flavored honey on toast. I would love to try the Vanilla one on my toast in the morning. Thanks for this great giveaway! I would have a honey (vanilla) and peanut butter sandwich. Thanks! I would try Organic Strawberry on toast! I would really like to try the Creamed Raw Honey - Organic Raspberry. That sounds so yummy. I would put it in my warm tea. I would love to try the Blueberry on toast or a pancake! i would love to try chocolate on a waffle! Definitely the Blueberry because I love blueberry everything! But, the Chocolate sounds very interesting!! I would love to try it. The organic strawberry sounds good....maybe on some nice fresh bread. I'd choose the plain and have it in my morning yogurt and granola. Oh they all sound divine! I would try the Creamed Raw Honey - Organic Pumpkin Pie Spice first and put it in smoothies with yogurt. I'd like to try the organic raspberry on an english muffin! The Creamed Raw Honey - Organic Cinnamon sound delicious and we'd put it on GF pancakes! Plain sounds best since I like the taste of honey. I would put it on my english muffin for breakfast. I want to try the cinnamon on a stack of pancakes. THe strawberry sounds the best to me. I would love to try it on a hot buttered biscuit. so tough to choose, but i like the blueberry! I love anything blueberry, so that would be my first choice flavor and I would try it on toast and waffles. I want to try the Strawberry, and I would serve it on waffles! The blueberry sounds best and I'd put in on muffins. I'd like to try organic chocolate and I'd put it on french toast! I want to try the Organic Chocolate flavor on waffles! The vanilla flavor would go great with the whole wheat zucchini bread I just took out of the oven! Creamed Raw Honey - Organic Cinnamon on muffins or toast. I want to try the organic strawberry with french toast sticks. I think my kids would like the Organic Blueberry! I'd like to try the Creamed Raw Honey - Organic Strawberry 10 oz on some toast. Sounds so good! I would like to add the blueberry one on my pancakes.